Kirtan is a call and response of Sanskrit chants or mantras. It’s typically done to a guitar, with a drum maybe, and often a harmonium. The mission of this website is to get everybody in New Zealand doing yoga – but it’s really important to remember that yoga is not just about the physical postures called asana. One of the lesser known and yet perhaps most powerful forms of yoga is Bhakti Yoga. This is the yoga of devotion and is often practiced via kirtan – or chants. Take a moment to think of your favourite music right now, and how it makes you feel when you sing it – when you lose yourself and get right into the mood. Well that is what happens with Kirtan – only more so. 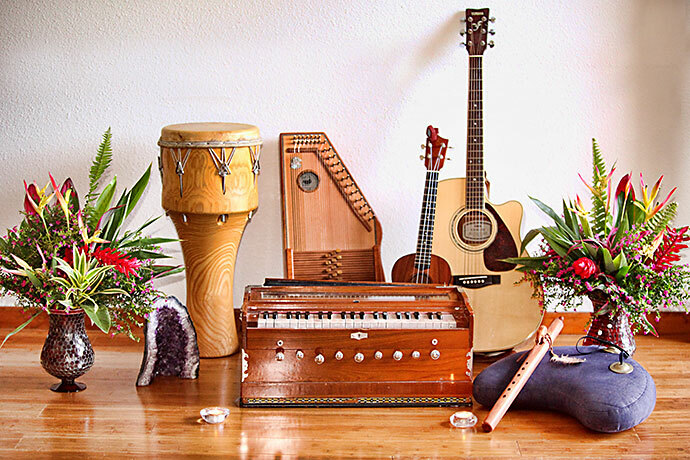 Kirtan is a call and response of Sanskrit chants or mantras. It’s typically done to a guitar, with a drum maybe, and often a harmonium. Songs are simple – just one or two lines repeated over, and over, and over. And in the repeating of these unfamiliar words which feel like aerobics for the mouth something truly magical happens. The pranic body (pranayama kosha) is affected. The pranic body is the subtle energy layer that we begin to tune into and directly experience when we practice yoga. 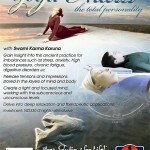 It transmutes pranic energy from the environment into life force energy – for example, via breath work, or pranayama. When our Pranic body is strong, we feel fearless, youthful, healthy, and an innate innocence. Bhakti yoga is one way to clear out blockages in the Pranic body. In particular, Bhakti yoga works with the heart – Anahata chakra. It’s about love, acceptance and surrender. Last Friday, we had a small get together at my house for some impromptu kirtan with Tyag. He runs monthly kirtan class here in Wellington, but our group loves it so much, we’ve started getting together every Friday night or so just to jam and chant together. I mean, what better way to spend your Friday night but chanting Sanskrit and opening the heart chakra? It sounds so vague and New Age-ish, but I am blown away by the immediate and very real effects of this practice. When the heart opens, you feel it – like a soft popping within and an explosion outward filling the chest and rising up the outsides of the body to the crown and exiting through to the ceiling. At least, that’s what it felt like to me as we chanted last Friday night. And yep, it sure is. We were high. Our hearts were opened. I felt connected. And I was amazed at how easy it was to just be me and to enjoy being me. What a joy! 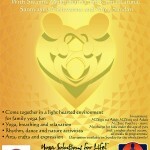 Yes, kirtan brings yoga to the people, in an inclusive, heart-opening way. Out of all the ways I have practiced yoga, nothing has had such a strong, measurable and pleasurable effect as bhakti yoga and kirtan. It’s like taking a pill that instantly opens your heart and makes you feel like you love everyone and you’re part of this huge interconnected whole and you just want to dance and sing. And I can say that Bhakti Yoga and kirtan has just as strong an effect on consciousness and experience as the very best pure MDMA. Except it is not fake, not chemical, not illegal, and it doesn’t end in a horrendous come-down and with serious short and long-term side effects to your body, mind and soul. The only side effect you might experience after regularly doing Bhakti yoga and kirtan is discovering a singing voice you didn’t know you had. That has got to be a pretty amazing thing. So, if you want to open your heart and experience the greatest natural high this is – you need to try bhakti yoga or kirtan. So get yourself to a local class, and find out for yourself how yogis get high. I love kirtan! It truly is “getting high” in the best possible way. One of my favorite parts is the energy in the silence AFTER the conclusion of a chant. The audible vibration passes, but remains within and between the energy of all participants. You are so right! That silence is magical. What also blows me away is how the quality of the silence and the sensations in the body are so different, depending on which chant you’ve just done. Thanks for the heads up – always great to spread the kirtan word! Looking forward to listening to some of your podcasts.